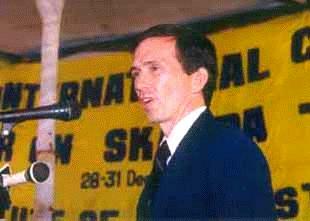 Above: Cultural Survival volunteer Patrick Harrigan addresses the First International Conference Seminar on Skanda-Murukan which he organised in Madras, December 1998. 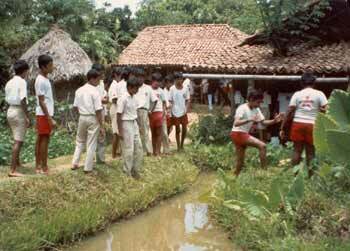 Below: The Samudra Cottage hosts school children from Colombo's International School for guided tours and lectures on Sri Lankan indigenous culture. Cultural Survival links research to action on behalf of threatened communities as they shape their future and protect their cultural and natural resources. Our local and international information network brings together traditional spokespeople, scholars, and representatives of other concerned agencies. Cultural Survival education and public policy programs disseminate crucial information through modern communications media, helping both the public and private sectors to respond appropriately to local needs and aspirations. We present professional papers, public lectures, television and newspaper coverage and special events for schools, policy makers, community groups and the media. Whenever feasible, we help to create and implement culturally-sensitive government policies through direct representation on government policy boards such as the Wannietto Trust and the National Committee for the International Year for the World's Indigenous People under the Ministry for Transport, Highways, Environment and Women's Affairs. "Tamil Virtual University", report to the Tamil Nadu High Level Committee to create a Tamil Virtual University, September 1999.